An occasional and well-timed notification bearing a relevant, timely, or useful message to users based one some kind of audience segmentation or activated by a trigger will be exponentially more effective than sending everyone the same untargeted message at the same. So what is the key to retaining your web push notification audience? People are busy, and in a hurry, and they don’t care for needless interruptions to their day. Your users are already inundated with push messages on a daily basis. Breaking someone’s concentration with a push notification that is generic and clearly intended to help you more than it is intended to help them will build resentment and lead them to disable push notifications from your website, probably for good. They ain’t comin’ back -- you lost ‘em forever with your spammy spam. If you’ve ever been on the Internet then you’re likely to realize that web surfers are bombarded and inundated with requests to allow notifications. Of course you don’t want to know every time that every website that you ever visit adds a new page, or just wants to say “Hi” to you (hoping you’ll come back for another visit) but some websites are more relevant to you than others, and so there may be some topics and subject you want to stay on top of and re-engage with regularly. The key to sending out effective web push notifications is crafting something worthy of other people’s time and attention. If you’re informing your target audience with applicable and timely content, then you’ve halfway won already. What you really need to do though is drill down into the data you collect in whichever analytics programs you use, and learn in-depth who your audience is actually comprised of. By sending notifications to different users specifically based on what segment of your audience they fall into, you’re maximizing the potential your push notification strategy because each notification then serves a more relevant purpose to each individual who receives them. By targeting your audience with notifications specific to the category of user they happen to be, they’re less inclined to stop receiving notifications from you because they actually find your push notifications handy and useful. Sending notifications with apt timing and a degree of personalization catapults you toward being among the most likely-to-be accepted push notifications being delivered to users. Remember: nag them and you’re done. One tap to stop receiving push messages is all it takes to end it. It’s important for you to understand, though, that more than 7 out of 10 users who download an app will ultimately uninstall it because of how annoying the notifications are. Just uninstall the app completely. Websites don’t get “installed” but users can still turn off all future notifications for your website. 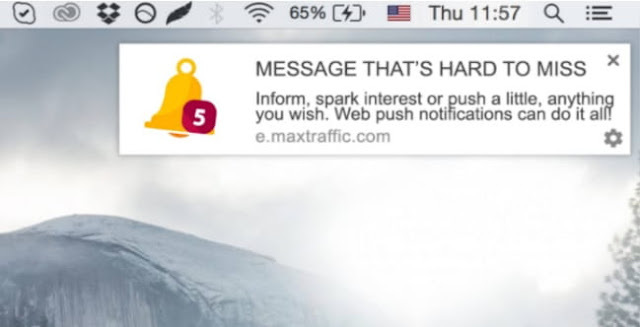 Web push notifications that are timed respectfully are also being timed more effectively. Notifications sent at sub-optimal times of day won’t get noticed by most people. Either sending notifications during busy times when they’ll probably get lost in the mix of all the media flying at users during peak hours. Don’t expect to compete with all the email and social media flying around a user’s phone or computer. But also consider the various time zones you might have an audience in. Segment your audience based on physical location & schedule accordingly. It’s just a matter of collecting user data when they come to your website and sign up for something, or detecting their nation of origin using their IP address. Along with an email address and their name, ask them for their zip code or what country they’re in. Doing so lets you know what time it is where your users are before you nudge them with an alert. You can also easily target individual countries and send push notifications by timezone. You want to avoid annoying people too late at night or very early in the morning. Let them rest, and get to them at a time of day when they’re alert and active but as much as possible try to time it so they aren’t busy with 20 things, like mid-mornings or mid-afternoons, perhaps. It will all depend on the many variables specific to your industry and particular endeavor. People love hearing or reading their own name. Personalizing your notifications goes a long way towards getting them noticed. If you are collecting first names, automate your push notifications to insert a user’s first name in the message you want to send to improve the odds that they’ll pay attention when they see it. Generic messages not targeted at anyone in particular are the easiest to ignore and the least likely to grab someone’s attention as they hastily and somewhat mindlessly check their phone for the thousandth time that day. Another way of making push notifications on the web more personalized is to put a system in place where they are triggered by user action or based on user behavior. One of the best uses of a push notification is tying its delivery to some event or action undergone by the user. Triggered notifications are the most likely to be engaged with by users because they actually caused the message to be sent. Some action taken by the user, whether it be a successful completion of a signup form, or any other trackable event triggered by the user, has caused a specific message to be delivered to the particular individual in relation to real human activity actively taking place or having recently taken place. Even inactivity is an action that can trigger a welcome push notification, for example after a certain amount of time has elapsed since the user’s last login, or an amount of time has passed since the first trigger was activated. In the same way you analyze data collected by your website’s analytics software about who your audience is and exactly how they interact with your content, you can also study the aggregate data on your push notification campaign. Just starting out, the bit of data your business collects won’t mean all that much, because you need a large sample size over an adequate period of time to reveal trends and show real clues as to the probability of certain content working better than other content. If you don’t measure the impact had by your push notifications, you’ll have no way of knowing how they’re performing and what you can do to improve their performance. Some messages you craft will work the way you want them to more often than other messages you craft, so by looking carefully at what has worked and what has not so far, you get a good idea of what to try more of, and what to maybe throw in the digital scrap heap. One message that works for a certain audience segment may be totally ineffective with another kind of person, which is why it’s so important to learn well what your audience is all about, where they are, what they’re like, and why they found your site in the first place. People search for different stuff online, so consider how users find your site to begin with so that you understand what kind of content will be relevant to them moving forward. Using targeted landing pages optimized to convert visitors into subscribers or customers is the best way to identify and keep track of different kinds of users with different reasons for searching the web. If your message isn’t relevant to the recipient, he likelihood that they’ll turn off future notifications from you goes WAY up. Track what works, and do more of it. Abandon the messages that don’t get results, and amplify the messages that work. Try several variants of a theme to explore who responds to what. Sometimes just changing or adding (or removing) a single word can multiply the click-through rate exponentially. If recipients aren’t responding to a message you’re pushing, abandon it, and try something new. Experiment, and stick to what sticks! These five key tips you’ve just learned about are so essential if you want your notification campaign to be worthwhile. Push notifications when they’re effective can work wonders for your business online, but if you aren’t measuring the results and targeting audience segments with cleverly customized content, you’re kinda’ wasting your time. I hope you enjoyed this article about push notifications campaign success strategies to lead your mobile marketing.